" The truth may be stretched thin, but it never breaks, and it always surfaces above lies, as oil floats on water. " Kemma is slightly on the tall side for women, and with a thick, muscular build that says more for the long hours of training she puts in than for her genetics. Everything she has control over with regards to her appearance is precise, regimented, and without much adornment. Her hair is shorn close to her head, her clothing is practical yet always neatly pressed, and her knots look almost as new as the day she got them. Her boots are often waxed to a brilliant shine, and she shuns both jewelry and makeup. Beyond her control is the looks she was born with: skin near as dark as ink, black eyes, and night black hair that's tightly curled when allowed to grow more than a finger’s breadth, though it never is. She has a angular face, high cheekbones, full, thick lips, and small ears. She possesses a rather full bust and wide hips, though her shoulders are only as wide as her muscles can make them; she is not, by nature, broad-shouldered. To Kemma, every one of these things is irrelevant to her life. They neither help nor hinder her pursuit of a chivalrous life, and thus they do not matter. They simply are. Kemma, well, Kemma wants to make the world a better place. Specifically, she wants the world to be more like the one that exists in the Harper’s tales of chivalry, of knights and honor, princesses to rescue and marry. Of course, she wants no part of being a princess; being a damsel in distress sounds a rather boring job to her. No, she wishes she could be a knight, even if all the ones in stories are men. She's big on honor and chivalry, and holds herself and others to the high standards of the tales. Rules are important, but of the utmost importance is doing the Right Thing; that, of course, usually aligns with the rules so long as the ruler is just, but if it didn't Kemma would choose the side of justice over rule-following. She's extremely loyal, and will always keep her word. If keeping a promise would mean conflicting with what she saw as right, she'd have a serious moral quandary on her hands, and Kemma in a moral quandary tends to all but shut down entirely until she resolves it. She deals with physical conflict easily, and most interpersonal conflict is brushed off as unimportant, but moral conflict can stymie her for days on end. She's both brave and stubborn, a potentially dangerous combination that can lead her straight into the most hazardous situations, and more so because she has a strong drive to protect everyone else. After all, she's the hero of this story. Despite wishing she could cut a dashing, noble figure, Kemma is in fact not actually very socially adept. To her, everything has the potential to be serious business, and very little is seen as a laughing matter. She's stiff and proper, often overly formal, and doesn't really know how to relax. Well, she almost doesn't know how to relax; after a drink or two, she loosens up a bit. However, after three she tends to turn melancholy, so it's a thin line she treads. When alone, she can tend to be rather defeatist and pessimistic. She wants to be good enough, but isn't certain she can be. She worries that she won't succeed in making Pern better, or that her efforts will somehow actually make things worse. After all, the past isn't always better than the present. It's a very specific view of the past Kemma wants to bring back, more about attitudes and saving princesses from savage beasts than anything political. Her current ambition, her dreams of making Guard-Captain currently on hold (as she has never actually lived at a Hold), is to become Weyrleader or Flightleader if she Impresses a dragon, or Wherleader if she ends up with a wher. All the better to bring back the time of chivalry with, after all. Kemma was the first of two children born to a woman who frequented the beds of riders during Flights. She should have been hale and hearty, but was born a few weeks before her time, and spent much of her early life rather sickly. She later gained a half-sibling, but for several Turns wasn't able to play much with the other children, being often laid up with colds and coughs and other ailments that most children were able to shrug off like so much water. So instead, much of her early childhood was spent listening to the Harpers; she was especially fond of the tales of a bygone era, where the rules of chivalry reigned and princesses needed saving from savage beasts. When she grew older, and with her age she also grew healthier, Kemma continued her love of those stories and began to want to bring them to life. While her half-sibling wanted to race runners, she wanted to learn to ride them better, so that she might travel the world astride her valiant steed, follow the chivalrous code, and save people from whatever it is they might need saving from. For her tenth Turn-day however, she got not the noble destrier that she so desired, but a pony. A rather small, lazy pony who wanted to do nothing more than roll about in the fields, eat grass, and sleep. Kemma was infatuated with him regardless, and named him Rocinante after one of the warhorses in a tale, and was practically inseparable from him. Despite not living at a Hold, and not being a handler who would actually make up the Weyr Guard, Kemma decided to train as a guard. On her own, of course, because nobody else would have her. But still, she spent most of her time trying to improve herself, no matter what other people might think of her activities. She was too young to even be considered for a wher, and Roci was possibly the farthest thing from a valiant warhorse that ever lived, but still she worked. Occasionally she stood with Vashanti as a Candidate, but she was never really that interested in it all. She was going to move to a Hold someday and become Guard-Captain, but only after retiring from her life as a traveling knight. However, when Vashanti decided to go to High Reaches to help rebuild, she went with cer. After all, if she went to help there, she'd be a proper knight errant! Probably. She was never sure if a knight errant was one who went on errands, but it certainly sounded right. So she went, and became a Candidate to boot. Even if that hasn't worked out for her thus far, she certainly hopes it will. Eventually. If she can somehow get to be in charge of the Weyr, why, she could do even more to make it better! And besides, Vashanti Impressed to a blue and became Vash'ti, so why shouldn't she join her sister as a rider? Or a handler. Either way, Kemma just wants influence. So long as she can somehow rise to the top of the ranks and help people on the way, she's not too picky. Impresses to Green Steampith, who is just as stubborn as she is, but with slightly different opinions. They clash. In her first Fall as a Weyrling, a downdraft flips Steampith into the ground, breaking her neck. The pair's training is significantly set back. During the same Fall, Kemma's sibling Vash'ti is killed. The next autumn in Threadfall, Kemma is badly scored along her right arm and side. Though most of it will just heal to extensive scarring, the damage to the underlying tendons and muscle in her right hand and wrist was severe, and she'll never regain much dexterity or grip strength. Has finally admitted to her feelings for Jae. If it weren't for her size, Steampith would easily be mistaken for a bronze. She is a dulled green with a distinct shine to her. She has a compact body and thinner legs, but she is unusually hardy for a dragon. She has the strength of storms and mountains in her. Her underbelly is a mossy, dull green, with darker markings over her feet like boots and gloves, the kind one would see from smiths and forge workers. Over her back is a lighter, almost white-green punctuated with markings that look like rivets and metal plates. Her wings are mostly a pale green, fading abruptly to the darker color. Steampith's voice has a strange, metallic warble to it. It doesn't sound like a lady at all, more like a bird. 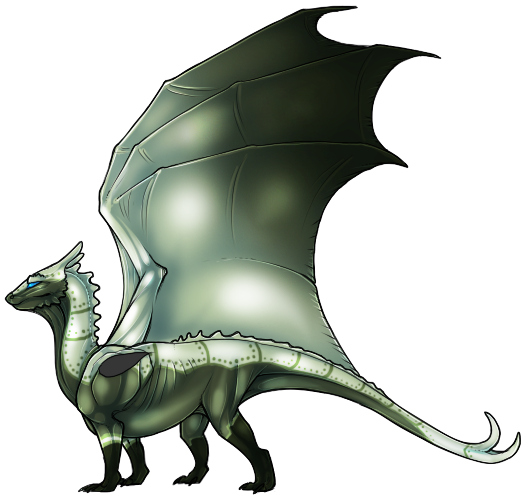 Steampith is a dragon who is more at home on a ship or maybe just constantly moving. She needs to be traveling. But it isn't quite that, she is very much a captain. Everything must run smoothly or she has failed her job. And if that means she needs to herd livestock or try to farm to make things work then she will absolutely do it with no hesitation. She has very little reservations about challenging leaders, especially if they are (in her eyes) incompetent. She is completely immune to compulsion, and does not understand that is not normal. She is a strong green, she is made to lead. To her rider, Steampith is a valued crew member and a friend. That still means she is their captain, and will hold them to her standards instead of the standards of the Weyr. She may inadvertently start fights because once she gets into something, it is hard for her to stop. There is a drive to be better, and to set a good example for those younger than her. She isn't concerned with being the #1 green in the weyr, but she will strive to lead by example and be a good captain.... actually, Captain Steampith has a ring to it, doesn't it? Standing just over 12 hands and with the stocky build and large head so commonly attributed to ponies, Roci is anything but imposing. He's largely brown, with mealy light tan markings around his eyes, chest, upper legs, and his muzzle is almost white. However, his lower legs darken to an almost black color, as do his ears and the center of his face, and his mane and tail are largely black with scattered brown and tan hairs. His fur is thick, and he gains a rather impressively fuzzy coat in winter. He's not built for speed, for strength, or for much of anything, but he is a sturdy little creature if only he actually felt like applying himself. Roci is, in a word, lazy. 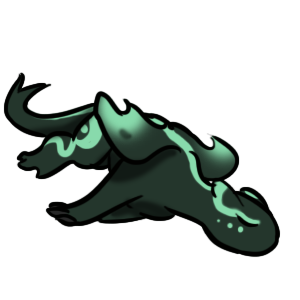 He doesn't have any particular inclination to do anything more than laze about, occasionally roll in the grass, and sometimes refuse to get up after rolling because it's just so much effort. 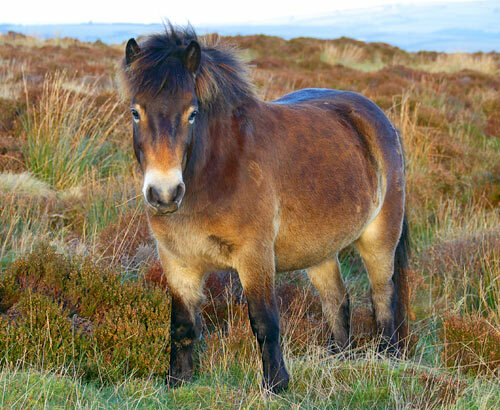 It takes quite a bit to get him to budge when he doesn't want to, and while he lacks the viciousness that many of the smallest ponies possess, he has all of the stubbornness. He's a terrible riding pony, often refusing to do anything above a sedate walk unless bribed with carrots, which he is extremely fond of. He's quite loyal to Kemma however, and would do just about anything for her... so long as it didn't involve running. He'll grudgingly carry her around, and will even trot for her. Sometimes. Really he wants to please, but his innate laziness just tends to win out. He is, however, quite good at tricks, for those rarely involve the expenditure of much effort at all. Sitting? Oh, he'll happily do that on command. Raising a hoof? Sure. Showing his teeth, why certainly. Gallop? Not on your life.